I am a big fan of Moda’s V&Co Ombré gradient fabric. So when they came out with Ombré Confetti Metallic this year, I was very excited to use it. It’s Ombré with confetti sprinkled on it! The design possibilities are endless with these fabrics and so much fun. I know I’m going to be sewing with them for a while. The colors are amazing – there are twenty different ones in all! For this quilt, I kept it to just 5 colors, with the grey being the predominant color. I had so many ideas for different quilts using this fun fabric. I wanted a block where I could pair the solid Ombré with the Confetti Ombré, so I designed a little herringbone child’s quilt. I made 192 Half Square Triangles for this quilt. The quilt finished size is 36″ x 48″. I made all the HSTs by using my eight-at-a-time method, which is just so fast. The HSTs were 3.5″ trimmed and 3″ after being sewn in. I used five colors and Kona White for the background. The graphite grey color was sort of my anchor color and I used twice as many HSTs in that color than the other four. I used two layers of Warm and Natural cotton batting for this quilt. Do you feel sometimes that one layer of Warm and Natural is just too light? Sometimes I want a warmer quilt and so I tried it on this one. The basting process went great and it quilted up like a champ, with no puckers or problems. And it has double the warmth. I debated how to quilt this herringbone pattern. I decided to go ahead and follow the zigzag pattern of the quilt, although this was going to require a lot of shifting of the quilt in the machine. However, I broke out my knee lifter and that helped a ton – I didn’t have to take my hands off the quilt to lift up the presser foot to shift the quilt. I don’t need this gadget often, but when I do, I’m so glad I have it. For the binding, there was no question I was going to carry the grey dominant color to the binding – and that confetti fabric is perfect for a fun binding. I cut 2.5″ strips to make the binding. Here is a tutorial on how I did that. I can’t wait to sew with some more Ombré Confetti! It’s so fun. I’m listing the quilt in the Shop. This entry was posted in baby, finished quilts on April 11, 2018 by Beech Tree Lane Handmade. This is a custom order baby quilt and pillow that I just finished and wanted to share with you. I was excited to use this “Children at Play” balloon fabric and had quite a nice time deciding which colors to pull out from it for the quilt. Many of you contact me with questions about specifics on making quilts, so although this isn’t a pattern, I’m going to try to give you some better cutting details for this quilt. The finished quilt measures 36″ x 48″. It is made up of twelve 16-patch blocks. Each patch is 3″ finished. I have prewashed all fabrics. To make the 16-patch blocks, I cut (22) 3.5″ strips of fabric from the WOF. (I cut more strips from the balloon fabric than the solids or dots because I wanted the balloon fabric to repeat more in the quilt.) Then I cut these strips down into 16″ lengths. I sewed together four 16″ lengths to get a strip set. I varied the position of the fabrics as much as I could to get different combinations of fabrics within each strip set for a total of 11 strip sets. Then I subcut these strip sets into 3.5″ strips. Four of these subcuts were sewn together randomly to make (11) 16-patch blocks. I used the leftover fabric from the initial cutting of strips to make the 12th block that I needed. I didn’t keep strict track, but I believe I used about 2.25 yards of fabric for the top. I had scraps left over with which to make a pillow top also. After you have all your blocks sewn, lay the blocks out to see what kind of order you want them in. Sew them into rows, making sure to press the seams of the blocks all the same way in each row. Alternate the direction of this for each row so that when you sew the rows together, the seams will nest. I used Warm and White for the batting. The binding is a cute stripe from Michael Miller called “It’s a Girl Thing – Little Stripes” in purple. Sadly, it’s no longer available. I considered a bright pink bias stripe first, but decided the purple was the perfect color for the binding. I’m really glad I went with it. I cut 2.5″ strips and used this machine binding technique. To cut 2.5″ strips quickly, I used my trusty Stripology ruler. I do love that thing. Makes cutting lots of strips so fast. For the backing, I used the Michael Miller balloon fabric and was so happy with it. It’s such a cute backing. The little whimsical girls and rabbits are so fun. I machine stitched the quilt with Aurifil Natural White in 40 wt. It’s a little heavier than the 50 wt. 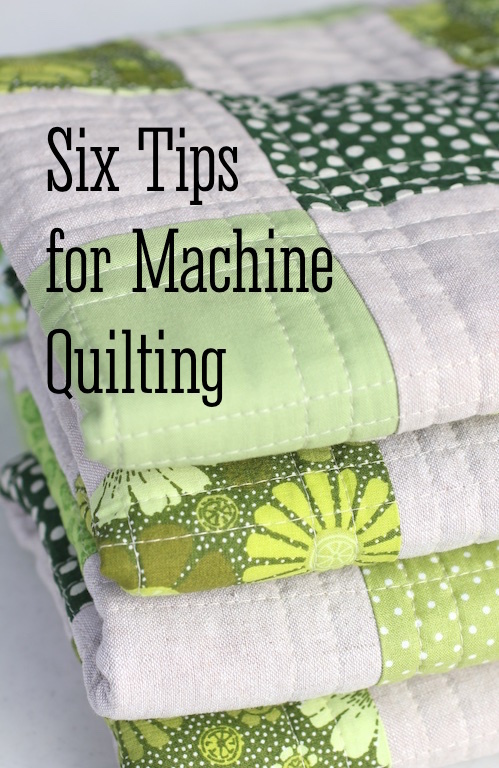 and I like the way it stands out more for machine quilting. (I do use the 50 wt. for piecing.) I quilted this at a 4.0 stitch length with a walking foot. There was also a Reading Pillow made to order to go along with the quilt. I do hope these instructions are helpful. Feel free to contact me with any questions. This entry was posted in baby, finished quilts, tutorial on November 27, 2017 by Beech Tree Lane Handmade. Michael Miller came out with this cute Safari Friends fabric line and I couldn’t resist it for a quilt for a baby boy. I love blue and white together, and the grey in the fabric was the perfect third color. The line also had a really cute dotted fabric and then I pulled some great Kona solids to match the colors in the fabric. I really wanted to highlight the safari fabric on the front of the quilt, but the characters on the fabric were so large that it would not have made sense to cut those into 2″ or 3″ squares – the animals would have been lost. So I ended up cutting 6.5″ squares of that fabric and then did 6.5″ nine-patch blocks out of the other fabrics. I made the nine-patch blocks by cutting 2.5″ strips of fabric, sewing them into 3-strip sets and then subcutting those into 2.5″ segments. I then mixed them up and sewed three segments together to get the nine-patch blocks. The quilt ended up being 36″ x 48″, with 48 blocks total. I used a different batting with this quilt and I think maybe I have found the perfect batting. It was Quilter’s Dream Cotton batting and I really liked everything about it. I use Warm and Natural most of the time, but this batting can be a bit stiff (it does soften up the more you wash your quilt) and can cause creases in a quilt when the quilt is folded for a long time. I have used Hobbs 80/20, but that batting did not have enough weight for me – it was too light. The Quilter’s Dream was softer than the Warm and Natural but had more heft to it than the Hobbs. I can’t wait to try this batting on a larger quilt, where I will use two layers of it (which I’ve been doing lately with my larger quilts). I’ll keep you posted. I used the Safari Friends animal fabric for the backing and I just think it’s so cute. I quilted the whole thing with Aurifil thread – Light Delft Blue – at 4.0 stitches per inch. I usually do a lot more quilting, but because the front of the quilt was a little busy, I felt I didn’t want to quilt every single line, so I outlined the larger blocks and left it at that. The binding is a striped fabric from Hawthorne Threads. Have you ever ordered fabric from this online shop? Not only do they have a great selection of designer fabrics, but they digitally print their own line of fabrics and this stripe is one of those. If you like stripes, they have a great selection and so many colors. I used my regular machine binding technique to do the mitered binding. And because I think they are so cute, I went ahead and make a reading pillow to go with the quilt! The front has a pocket where you can slip a couple of books inside. 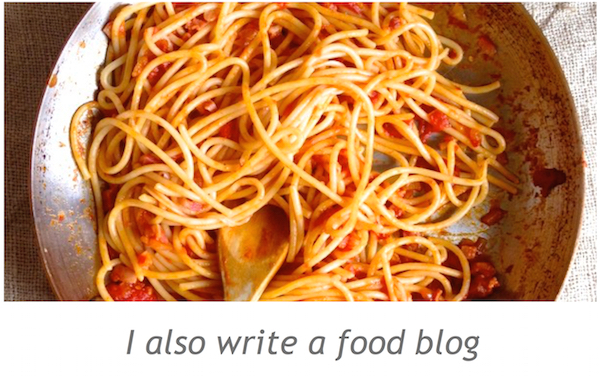 Thanks for dropping by – I hope you’re making something! This entry was posted in baby, finished quilts on April 24, 2017 by Beech Tree Lane Handmade. Pink alert! Here is a quilt to wrap a baby girl in that is as cute as can be. I used fabrics from the “Hip Hooray” line from Lizzie Mackay for Blend Fabrics. This fabric is hard to find now and I’ve had it in my stash for a while, waiting to use it. This line features a double border fabric with whimsical little animals on both of the borders. I cut the borders off and used them on either end of the quilt. I also took some of the border and fussy cut some of the animals out and used them for the patchwork center. Each square ended up being 3.5″ after being sewn in. I added a couple of more fabrics for the patchwork center, including a favorite Swiss Dot from Moda’s Essential Dot collection and a Robert Kaufman Carolina Gingham in Pink. I used Warm and White for the batting and did the quilting with Aurifil thread in Pale Pink. I almost never have to mark lines on my quilts. If I do, I usually use a Hera marker, which only makes creases. But for this quilt, I really did have to mark lines so I used a Clover water soluble felt pen, which required washing the quilt afterwards to remove all the markings. I have used a Clover Chaco marker in the past, but have found that these markers don’t work hardly at all after a while. Very disappointing! So I would recommend the felt pen instead. The lines washed right out nicely. 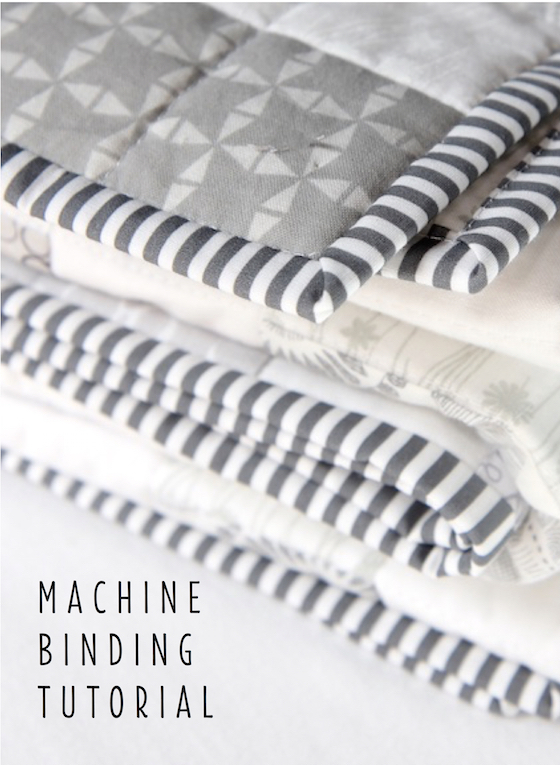 For the binding, I LOVE bias binding and a lot of fabric lines now are offering stripes on the bias, so you don’t have to actually make bias binding. This binding fabric is from Moda’s “Dot Dot Dash” line. I just love the look of this binding. I cut 2.5″ crossgrain strips and used my machine binding technique. This entry was posted in baby, finished quilts on April 10, 2017 by Beech Tree Lane Handmade. Lately I’ve been writing about how much I love Moda’s new fabric line called “Ombre”, designed by V and Co. These fabrics are gradient solids which, when cut up, look like you’ve used multiple solids. 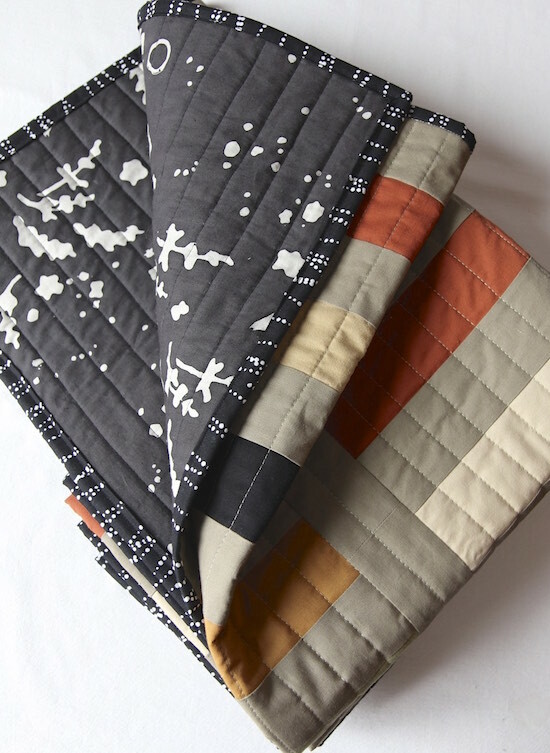 I really like using these fabrics and designed this quilt around two colors from this line – Honey and Graphite Grey – and I’m so pleased with the results. I had this design in mind for a while – to do staggered Missouri star blocks. I worked the design all out on graph paper and, because of all the varying negative space on this quilt, had to really do a lot of figuring and calculating – something I really like. No two rows were alike. There were some miscuts and ripping out, though. 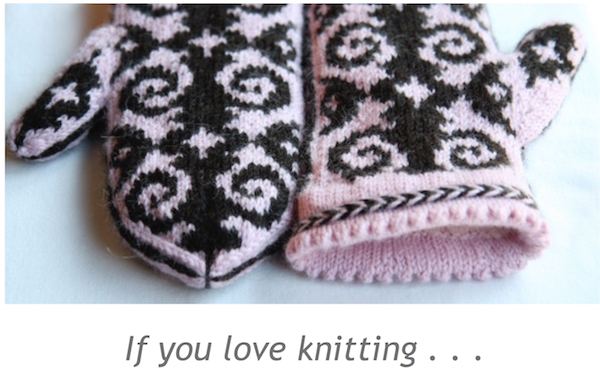 But that happens when you are not using a pattern! One of the things I love best about this quilt is the grey gingham binding. I have a nice stash of small size ginghams and I think they make the sweetest bindings. The background fabric is Robert Kaufman Kona Cotton Solid in White. Because of all the white in the background, I used Warm and White batting, a pure white batting from the Warm and Natural company which doesn’t create a dull background behind bright white fabrics. And it has the same feeling and low loft of regular Warm and Natural batting. For the background fabric, I used this adorable flannel backing in Organic Cotton from Cloud 9 fabrics. The yellow and grey elephants were so cute and just matched the Ombre colors so well. The flannel is soft and makes such a nice backing for a child’s quilt. The stars were made up entirely of Half Square Triangles, which finished at 2″ after being sewn in. This is what I used as my quilting guide, so the overall quilting grid is 2″. I used 50 wt. White Aurifil thread and quilted at a stitch length of 3.5. 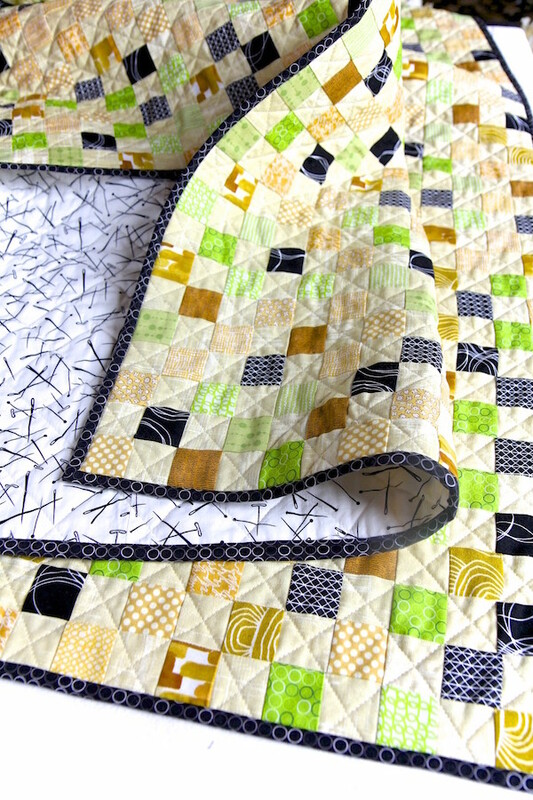 The quilting makes such a nice texture and drape. The finished size of this quilt is 36″ x 52″ . I love how it turned out and have listed it in the shop. This entry was posted in baby, finished quilts on March 14, 2016 by Beech Tree Lane Handmade. Between Amy Sinbaldi and Alisse Courter, I was in some kind of incredible Fabric Heaven in the making of this quilt. 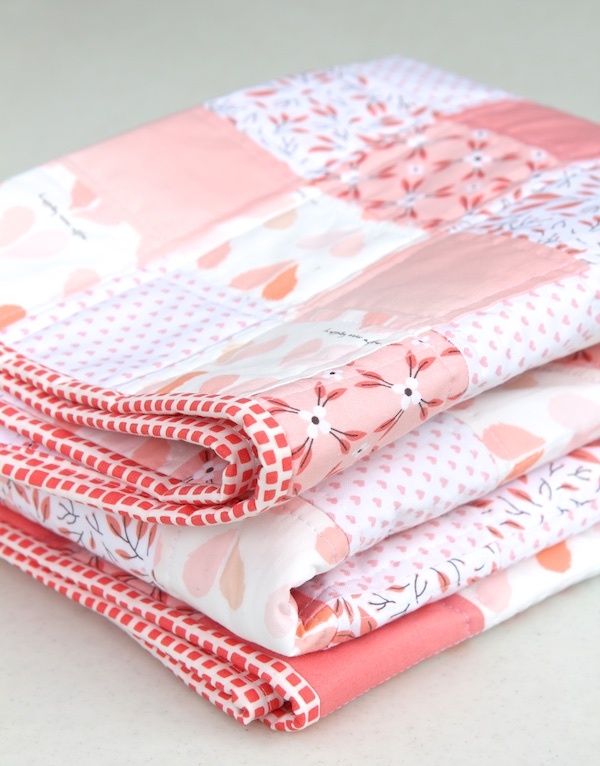 I had fallen in love a while ago with Alisse Courter’s Magnolia line of fabrics for Camelot Fabrics and couldn’t wait to make a cute little girl’s quilt with the peachy pink fabrics from that line. Then Amy Sinbaldi came out with her Paperie collection for Art Gallery Fabrics and when I saw her “Happily Ever After” fabric I knew it would go beautifully with those peachy pink fabrics. I didn’t want to cut these fabrics too much because I wanted the prints to really shine, so I decided on a 16-patch quilt. I cut 3.5″ strips to make the checkerboard pattern for finished 3″ squares. I think often this is the cutest pattern for baby quilts. Moda came out with a line called “Ombre” which is a gradient solid and I have found this fabric to be a real workhorse in quilts – it looks as if you’ve used two or three or even four different solids, but you haven’t. And instead of trying to match a bunch of different solids, the Ombre fabric gives you a few different solids from the same piece of fabric. I love this fabric! So I used a fat quarter of Ombre Popsicle Pink and got several really pretty solids from it. The other fabrics I used were Robert Kaufman Kona Solid in Baby Pink and Snapshot Hearts in Pink from Riley Blake. For the binding, when I held Squared Elements in Watermelon up to the quilt, it was the clear winner. For the backing, I used Floral Lattice in White from the Magnolia Line (sadly, very hard to find now). Such a sweet design. I love this particular fabric so much and it was so fun to see it as a full backing on a quilt. I used Warm and White 100% cotton batting for this quilt. This quilt finished at 36″x47″, a nice little baby quilt that you could use on the floor, snuggle up with or just as a pretty accent piece in a room. Can you tell I love this quilt? I have put this quilt in my shop, but it’s hard to part with it! 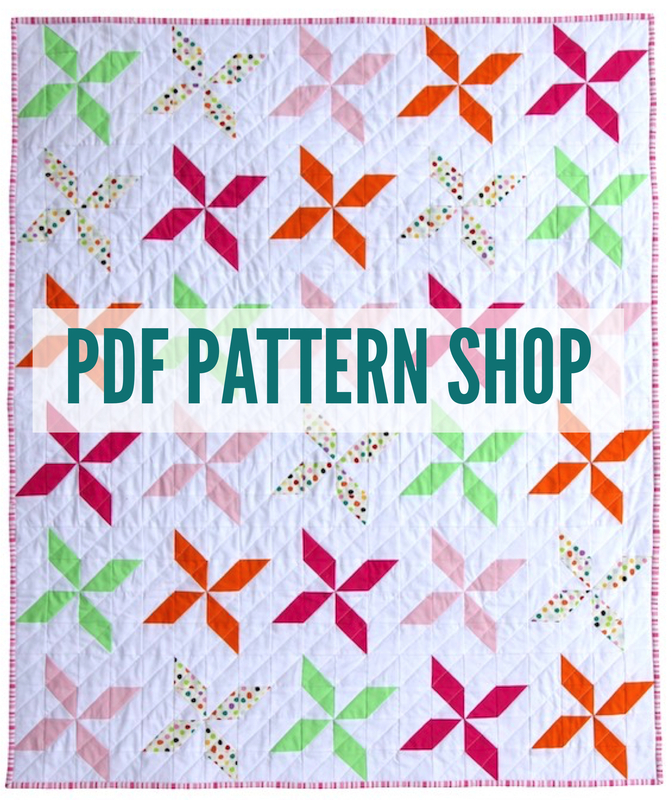 I’m linking up to Sew Fresh Quilts, Blossom Heart Quilts and Free Motion by the River. This entry was posted in baby, finished quilts on March 7, 2016 by Beech Tree Lane Handmade. After I finished my Little Owl Quilt, I had quite a few scraps leftover and wanted to use them in some way. I had an 18″ x 18″ pillow form laying around and thought a reading pillow would be nice. There’s a bunch of them on Etsy. I just pieced and quilted a pocket front in the same width as the pillow and sewed it on the front of a piece of fabric the same size as the pillow. I think it’s a fun pillow, especially to take with you somewhere and have your child be able to snuggle and have his books along. I love that bias binding! For the baby bib, I used April Rosenthal’s Charm Bib pattern. I altered a few things with it, though. I added a layer of batting to it and quilted it in the same manner as the quilt. I used a little piece of quilting fleece for the back. I also did a binding on it just like I do on my quilts, with an invisible stitch on the front made my quilting in the ditch. I used bias binding again, like on the baby quilt. The bias binding on the bib was a little tricky and required good “pinning” and a slow needle. This is how I attached the binding to the bib. Thank goodness for Wonder Clips! That would have been harder to do with pins. These were so fun to make. Can’t wait to give this cute set to the expecting mother! 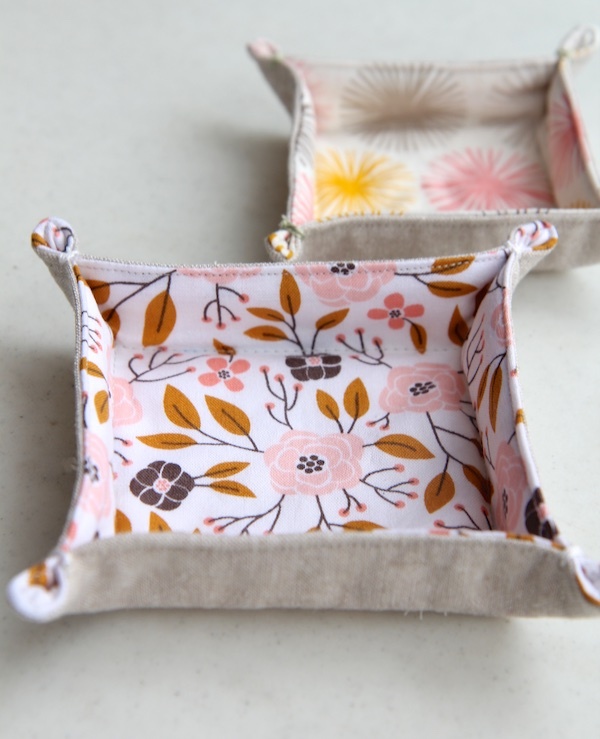 This entry was posted in baby, pillows on January 25, 2016 by Beech Tree Lane Handmade. What pure fun making this quilt was! You forget how fast baby quilts are to make until you realize that it’s binding time and the quilt is almost finished and it seemed to just fly out of the sewing machine. I made this quilt using what I think is a great combination to make a unified but interesting look: start with a cute motif fabric, add a solid, a little dot and a stripe. Four different fabrics that can create a bit of a scrappy look but looks cohesive. I started with a fabric from Anne Kelle’s Urban Zoology line for Robert Kaufman. This line of fabrics is so adorable and is perfect for stashing for future baby quilts. The little dot is Pinhead in Ebony from Michael Miller. The solid is Robert Kaufman Kona Cotton Solid in Aqua and the little grey stripe is probably one of my all time favorite stripes – Animal ABCs small stripe in Grey – I kind of hoard it in my stash. The backing fabric – eeeeek! It’s called Key Ingredient in Natural Blue from Chicken in the Ktichen Collection by Alexander Henry. I’ve had this in my stash for a while and couldn’t wait to use it. This quilt was made using 16-patch blocks, with finished squares that were 3″ each. To make these, I cut 3.5″ x 16″ strips from four different fabrics and sewed them together to make a variety of 4-strip “A” sets. I could have cut WOF (width of fabric) strips, but I felt that sewing those together wouldn’t have given me the mixed variety of sets I wanted. I subcut these “A” sets into 3.5 strips and then placed them out until I got a scrappy layout I liked. I then sewed them into 4-strips blocks and sewed the blocks together in rows. 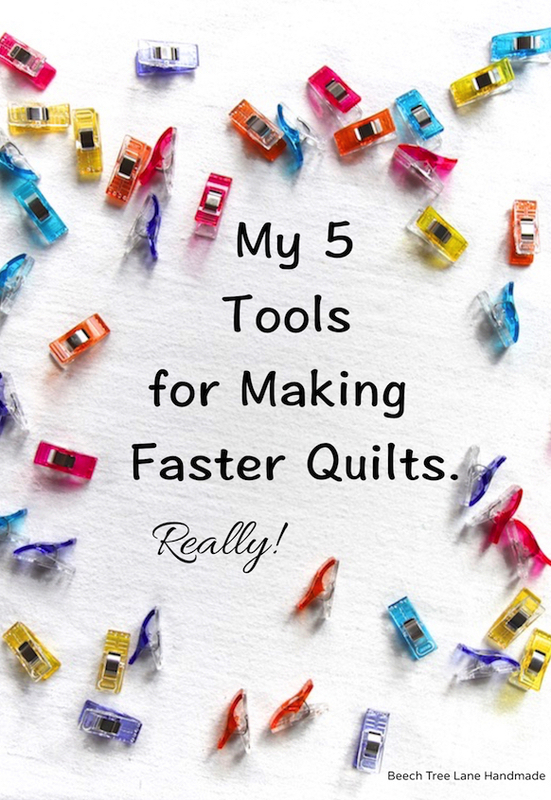 There were 3 blocks across and 4 blocks down to make a quilt that finishes at 47″ x 35.5″ (including binding). For this quilt, I thought I should make bias binding instead of my usual cross grain binding. 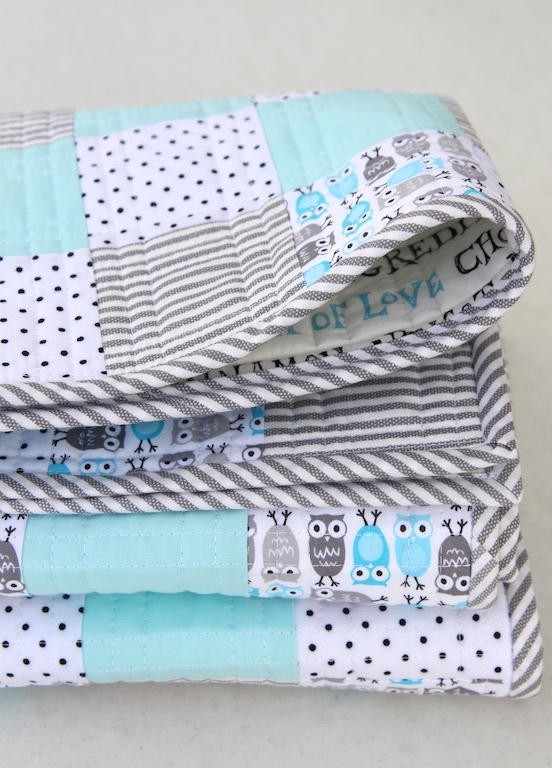 I thought the stripes on the diagonal added a little bit more interest, plus it’s more durable – especially for a baby quilt that might get washed more. To make bias binding, I use a Binding Buddy ruler by June Tailor that makes it a snap. I have the 2.5″ one but they also make a 2.25″ ruler. Makes it super simple! I think it’s also less of a hassle than making continuous bias binding – way too much fiddling for me. If you want to see how I apply binding, here is my tutorial on that. I quilted this with Aurifil 50 wt. thread and did double vertical quilting lines along all the squares. I used white on top and a sand color in the bobbin, to match the backing fabric. I used Warm & White for the batting. I was almost sorry to have this quilt finished, it was so fun! This entry was posted in baby, finished quilts on January 19, 2016 by Beech Tree Lane Handmade.